The following mares were owned or leased, and produced foals for the Brambleridge program. Half-Welsh mare by *Symondsbury Geronmio ex Brownland’s Showstopper. Dam of 2005 gelding, Brambleridge Spring Forward, & 2006 gelding, Brambleridge Starr’s Mill. Purebred Connemara mare by *Glenormiston Flurry Knox ex Tower Hill’s Fiona. Dam of 2005 gelding, Brambleridge Capability Brown, & 2006 mare, Brambleridge Cinder Ella. Thoroughbred mare by Silver Supreme ex A Merry Prankster. Dam of 2007 gelding, Brambleridge Bold Comedy (name changed to Elsbeth’s Shiloh). Purebred Connemara mare by Tre Awain Cavan O’Connor ex *Tyan Traveller’s Joy. Dam of 2011 filly, Brambleridge March Mayhem. Halfbred Connemara mare by *Grange Finn Sparrow ex Orchan's Echo (TB mare). Dam of 2013 filly, Brambleridge Avril Sparrow. 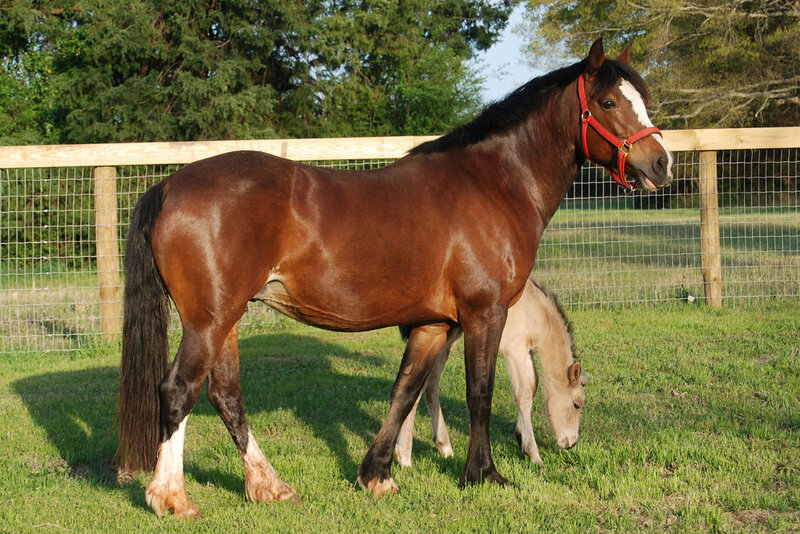 Purebred Connemara mare by *Grange Finn Sparrow ex Bluebird's Merry Chase. Dam of 2016 filly, Brambleridge Ardent Sparrow. Connemara Sport Horse mare by *Winmaur Sargeant Pepper (RID) ex Sassy Sister (Conn x TB by *Grange Finn Sparrow). Dam of 2017 filly, Brambleridge Avril Starling. Connemara Sport Horse mare by Salute the Truth ex Sparrow’s Tiptoes (Conn x TB by *Grange Finn Sparrow). Dam of 2016 colt, Brambleridge Ponder the Truth. Thoroughbred mare by Clever Trick ex Mirkwood. Dam of 2016 colt, Brambleridge Mithril, and 2018 filly, Brambleridge Blueberry Hill.